6. The UN predicts that by 2100 the world’s population will have increased by another 4 billion people. What is the main reason? 7. How did the number of deaths per year from natural disasters change over the last 100 years? 8. Worldwide, 30-year-old men have spent 10 years in school on average. How many years have women of the same age spent in school? 9. In 1996, tigers, giant pandas, and black rhinos were all listed as endangered. How many of these three species are more critically endangered today? 10. How many people in the world have some access to electricity? To refrain from too much suspense, at the end of this posting, I will reveal the answers to the questions above. However, I do want you to attempt them as they contain some very important lessons to be learned regarding the world we live in today. The answers are important in understanding the economic concept. Recently, I read that Bill Gates recommended five books for summer reading. Over the Memorial Day weekend, I completed two of the five and am committed to reading the rest. If Bill Gates thinks they are important, then there is no question that I should believe they are important as well. 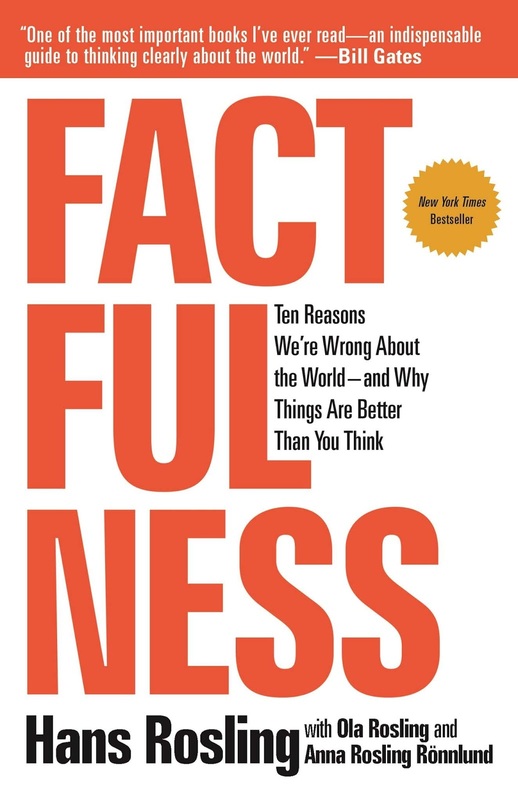 The first book, Factfulness by Hans Rosling, contains the basis of the questions above. Professor Rosling spent his entire lifetime studying the facts behind the above questions. His research consisted of a plethora of resources including actually visiting the mentioned countries and personally participating in their workforces. Interestingly, Professor Rosling passed away before the book was published. Through its fascinating economic perspectives and concepts, this read brings to light many of the misconceptions we have regarding the world we know today. As I must always do, I will review the stock market for the month of May 2018. This year has basically been breakeven, from the beginning to the end, but it looks like May might be the start of a much better year. For the month of May, the Standard & Poor’s Index of 500 Stocks was up 2.4 %. For the one-year period, it was up 14.4 %. The Dow Jones Industrial average was up 1.4 % for the month of May and up 18.9 % for the one-year period, The NASDAQ Composite Index was up 5.5 % for the month of May and up 21.3 % for the one-year period then ended. So that you have a basis of comparison, the Barclay’s Aggregate Bond Index was up 0.6 % for the month of May and down 0.7 % for the one-year period ended May 31, 2018. We did not learn a whole lot more than we already knew during the month of May. The economy continued to display its strength and exactly how good earnings are. Both components are positive signs for the future given that a good economy and increased earnings lead to higher stock prices. Interestingly, we went through several geopolitical events during the month of May that kept the stock market volatile. I wish people could focus on economics and ignore headlines. At the end of the day, nothing actually happened on the geopolitical level that should have any effect on future stock prices, other than war. However, it was interesting to note that interest rates actually went down during the month, which was the first time this has happened this year. We have had a very large increase in interest rates during 2018. At the end of 2017, the 10-year Treasury Bond was at 2.4%. Compare that to 2.83% at May 31, 2018. While it is likely that higher interest rates will in fact dampen stock market performances, the 10-year Treasury Bond will need to be closer to 4.5% than its current level of 2.83%. I think it will be a very long time before that starts to happen. I get so sick of hearing uninformed people on TV say that investors would be stupid to be anywhere other than in index funds. Unfortunately, that just illustrates how little they know about investing. This year, actively managed mutual funds are substantially better than passive funds. In fact, they are so much better that the returns are more than double what the index has earned this year. If anyone realistically believes that a passively managed index can beat a skilled stock picker with a full staff of research analysts then they are quite naive about investing. Every now and again, we have clients say that they would prefer to be just invested in passive investments. It is true that only 10% of the mutual funds will outperform an index over time, however that is a very large number of actively managed funds. Today, there are roughly 6,000 publicly traded mutual funds. Of those funds, 10% would be over 600 funds that outperform the indexes; we only invest in roughly 50 of the best. Yes, I would expect that actively traded mutual funds would outperform the indexes for years to come. One of the things we did learn during the month of May was that the unemployment rate is now at 3.8%. The unemployment rate has not been this low since April of 2000. I know it seems like that was just yesterday; it is hard to believe that was actually 18 years ago. If you remember April 2000, that was the peak of the NASDAQ in the middle of the Dot-com explosion. After that peak, the NASDAQ Composite dropped close to 70%. Fortunately, with earnings accelerating and interest rates still moderately low, I do not contemplate anything like that headed our way. For the month of May, virtually all of the international funds performed poorly due to a strengthening dollar. One of the economic concepts that keeps interest rates intact is that the interest rates in the United States are already higher than they are virtually anywhere else in the world. A strengthening dollar dramatically impacts the economics of Third World Countries and thus emerging market funds. As mentioned, the 10-year U.S. Treasury Bond is at 2.83% compared to the German 10-year bond rate at 0.378% and the Japanese 10-year bond rate at 0.038%. As you can tell, the U.S. rates are dramatically higher than the other two large economies, and this differential will prevent the U.S. Federal Reserve from aggressively increasing interest rates. If they were to do so, it would certainly strengthen the U.S. dollar, but would also hurt the U.S. economy and corporate earnings. Given the constraint on their ability to increase interest rates, it would not surprise me to see fewer rate increases by the Federal Reserve than what is currently predicted by too many market forecasters. One of the important discussions that always needs to be had about the growth of future earnings is the stability and growing nature of the economy. Every day, it seems like we get better and better news on that subject. During the month, the Federal Reserve of New York changed its estimate of the GDP for the second quarter to approximately 3% from the previously forecasted 2.3%. Typically for the first quarter, GDP is held down by bad weather and conditions where people just cannot work for whatever reason. If the Federal Reserve is correct and it is a 3% quarter, that would be extremely bullish for the stock market going forward. One of the best indicators of actual GDP is published by the Federal Reserve Bank of Atlanta, which is a local voting member of the Federal Reserve. On June 1, 2018, they projected that the growth of the GDP would be 4.8% for the second quarter of 2018! A number like 4.8% has not been seen in the U.S. in decades. If this number were correct, it would be a watershed for the economy going forward. Even I am not so optimistic to believe that this number is correct, but if there is a reading anywhere in the 3.5% to 4% range, it would clearly be a major catalyst for higher earnings in the future. I will not go into a long discussion behind the reasons for the previously mentioned questions and the correct answers. I will leave you to read the book for yourself, where the answers are fully explained. Like most people, the majority of my answers were incorrect. In fact, the first question literally blew me away since I had no idea that vaccinations were so widespread in the world today. According to the World Health Organization, 88% of one-year old children in the world today are vaccinated against some disease. The authors of the book rounded down to 80%, in their words, “…to avoid overstating progress.” That number is almost unbelievable. So for many years the World Health Organization knew that while they could not cure the diseases of the world, they could help prevent them. Now that 88% of the one-year-old children are being vaccinated, the world is making a huge attempt to tackle the issue of early childhood deaths. The long-term effect will be healthier children who are able to progress through the school system and eventually become contributing members of society. Likewise, the answer to the question regarding schooling was quite surprising. Worldwide, women age 25 to 34 have an average school career of 9.09 years and men of the same age have an average school career of 10.21 years. I am absolutely convinced that the facts in this book will change your thoughts on whether women worldwide face education discrimination or not. These facts say they do not. 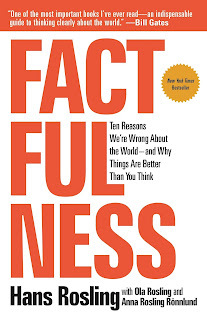 This book left quite an impression on me because of its optimistic view for our world’s future as compared to the negative news reports we read on a daily basis. If you review the answers to the above questions, it is a conundrum trying to make sense of what the news is telling us today versus actual facts. Thus, the purpose of this book is to correct the record and illustrate that things are in fact moving in the right direction, contrary to popular belief. In the United States, the economy continues to be strong, and quite frankly, the strength of the U.S. economy pulls the entire world to a higher economic standard. In China, the middle-class population has become very large compared to where it was 30 years ago. The advancement of the middle class in China has much to do with the United States buying goods and services from their Chinese manufacturers. As you can see, the strength of the U.S. economy means more U.S. goods. More Chinese goods are imported into this country and the end result is a higher standard of living for the Chinese that produce these goods. The book also goes into great detail explaining the progress that Africa is making in the advancements for the future. Most people still consider Africa to be a Third World Country, but that is clearly changing. One of the interesting aspects of what wealth can do to better a society is demonstrated by the Bill & Melinda Gates Foundation. This private foundation has set out to vaccinate the entire continent of Africa. We are not talking about one small town or village, but the entire continent. In order to accomplish that goal, Mr. and Mrs. Gates had to invent a refrigeration system for a large part of the world where electricity is not readily available. Using his innovative mind, Bill Gates invented a refrigeration system that can be shipped and work solely off solar power long enough to keep the vaccinations fresh for the people of Africa. From Harvard student dropout to one of the richest people in the world, Bill Gates strives to use his wealth for philanthropic purposes, making society better for the children of tomorrow. We read and hear so much about the negative aspects of wealth, but you do not have to look far to see the good that Bill Gates is doing for society. I am sure that many of you are thinking that the answers to the questions above could not possibly be correct. While I could quote the references, the author’s explanation is much more eloquent and thoroughly researched. Having read the book from cover to cover, I can assure you that the facts fully support the answers above. What is so interesting to me is the overwhelming perception held by Americans that the world’s lifestyles are deteriorating. These assumptions are not supported by the facts. In fact, after reading this book you will realize that there is a lot going on in the world that is positive and efforts are being made to help people escape the lifecycle of poverty. I believe people become skeptical of the stock market because they watch the nightly news. During a meeting with a client the other day, he wondered how, with all of the negative news reported, the stock market could actually go up. First and foremost, while the way one perceives life does affect stock market performance, it is a long way from being the most important factor. Elements that make the stock market go up are low interest rates, high earnings and a good economy. At the current time, we have all three of those components working for the benefit of higher stock prices. However, seeing all of the negative publication headlines makes me wonder what affect it must have on the attitudes of many Americans. I recommend that you read this book, especially if you are seeking a positive outlook on the economy around the world today. Today’s financial headlines are all screaming for a major market decline. However, I feel just the opposite. At the current time, I believe that the biggest risk to most investors is that they are willfully underinvested. I speak with clients everyday that have kept a substantial amount of money in cash. Leaving their money in cash means they will earn virtually zero. Textbook investing of prior years’ insisted retirees should have a large percentage of assets in bonds. That may have made sense years ago when life expectancies were short and inflation was mild, but given the negative performance of bonds year-to-date, investing in this manner is likely to prevent you from enjoying the full potential of a well-deserved retirement. One of the major aspects of planning for your retirement is to discuss not only your investment goals, but the process it will take to get you there. We encourage you to sit down and have a conversation with us regarding your thoughts on investing. Our office is open year-round and we look forward to meeting with you at your convenience.